I had one of those moments earlier where I did something pretty dumb. Make me feel better, what dumb things have you done? 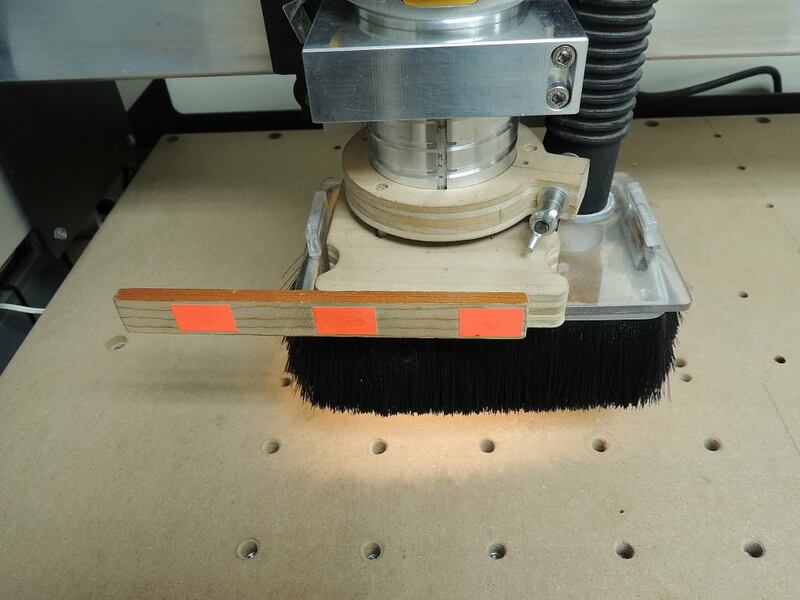 Big holes / slots in wasteboard, ruined stock 'cause I couldn’t be bothered to sacrifice a bit of scrap to test feeds/speeds, ruined endmills for the same reason. Installed a new wasteboard and leveled it. Designed a project for 3/4" pine, but then when I picked out a nice piece of pine it had a bow. So naturally, I ran a leveling toolpath over both sides to make it flat, bringing it down to 0.65". Ran my engraving with no issues, of course, then ran the cutout toolpath 0.65" over the wasteboard without changing the DOC from 0.75". Cut a really nice hexagon pattern 0.10" deep into my brand new wasteboard. Happened about six month ago but the part that flew away still orbits the moon! I was trying a new gcode sender…I think it was CNCjs… had a brand new 1/16" bit in it. I had just put a new piece of stock (forgetting to zero to that stock) then hit the home button. My new piece of stock was .25" taller than my previous and the end of the (brand new) bit snapped as the spindle ran its way home. Making a large, intricate sign which had taken around 6 hours also and was very close to being finished. As usual I was making changes to the design and cutting passes on the fly to get it all looking right. I was tired and didn’t notice one of the final design elements move in the CAD program when I was making a change. Of course it doesn’t cut in the right place…start again. What happened to “always move the machine slowly”? Must have eaten a double helping of Wheaties that morning! I tried to break dance on my XXL once, then realized I’m too old to break dance, that was dumb. When I first started using my SO3, I, for some reason, didn’t want to use the partially used bag in my shop vac. I got some new ones, tossed the old one, and spent the next few days carving, chasing with the vac hose (pre dust boot). I couldn’t believe how much dust was on EVERYTHING in the garage. I went to vacuum it up, and that’s when I realized I never replaced the bag and filter in my shop vac. I made some really nice aluminum hold down clamps soon after recieving my SO3. Didn’t run a simulation before cutting a project and buzzed one right in half. Evidently I didn’t learn anything because I did it again about a month later. I switched to double-sided tape. Because I learn so much from my mistakes I intend to keep making them. Nothing too serious for me. 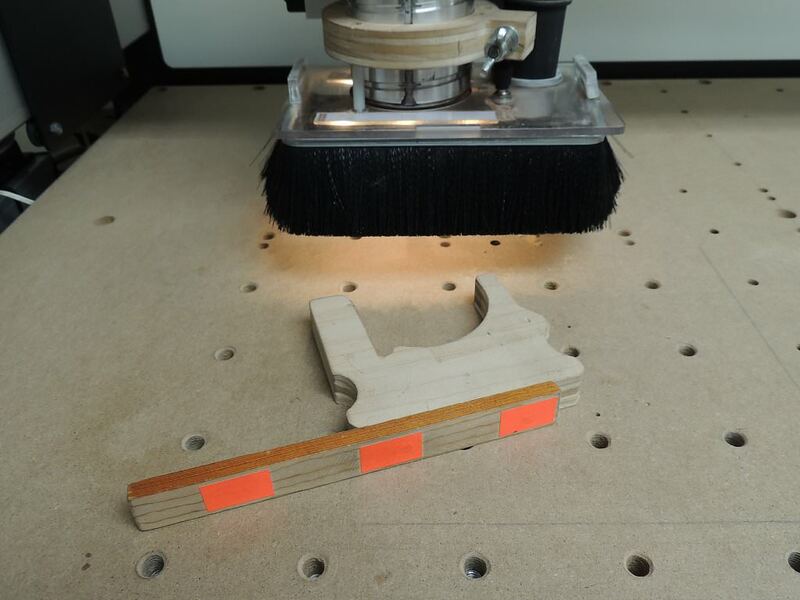 I have a u-shaped block that I slide onto the body of the router to depress the spindle lock button in order to free-up a hand to make tool changes easier. On at least three occasions I started the router with the block in place which made a lot of racket. I finally added an arm to it with some Day-Glo tape to make it more obvious that the lock block is in place. I’ve done that quite a few times with no problem. How did I get lucky? 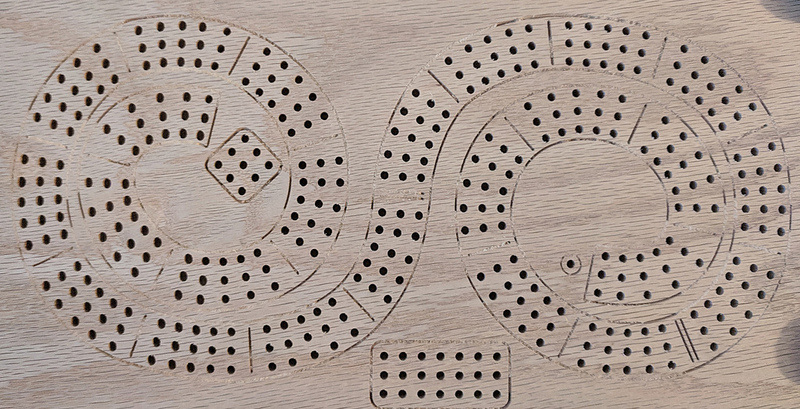 So, I got a nice cribbage board all designed up in Inkscape yesterday evening, and I pulled an SVG into Carbide Create to CAM it up. A few gcode saves later (lines, holes, et cetera), and everything was more or less ready. For the holes, I let Carbide Create make them as very slim pockets, then I pulled that gcode into Notepad++ and took it from 63332 lines to 1187 lines by turning all the pockets into straight plunges (with a Kodiak drill mill. I had just added an adapter to the end of the vacuum hose for my dust boot, but I had not checked the clearances. At the bottom of the Z travel for the holes, the router bracket ran into the vacuum hose adapter and forced a deflection, turning my nice prefectly-coded holes into oblong failures. You can see when I noticed and corrected the issue as the holes go from oblong on the left to nicely circular the rest of the way. I suppose I may as well optimize the gcode for the lines before I go again, but at least (other than the terminal issue) the project did properly resemble my intended reality. I recently realized that I was improperly probing for z after tool changes. Forgot I was supposed to set the probe on top of the material. Made a lot of sense once I figured it out since I thought my cuts were a little deep. Same here. Realizing you can probe for Z anywhere on the work piece (assuming everything is flat and square) made it much easier on jobs where the original Z spot was carved away.